The next choosing is fast approaching, and Agnieszka is afraid. She knows–everyone knows–that the Dragon will take Kasia: beautiful, graceful, brave Kasia, all the things Agnieszka isn’t, and her dearest friend in the world. And there is no way to save her. 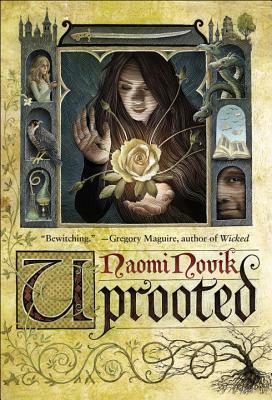 I adore Beauty and the Beast retellings, so when I heard about Uprooted I knew I had to get my hands on a copy. Now that I’ve read it, I can say it’s not so much a retelling as it is influenced by that particular fair ytale. And I loved it all the more for that. This is a book that is difficult to review without spoilers because the plot twists and turns so much. It might not be a direct retelling of Beauty and the Beast but it does an excellent job of keeping a fairy tale feel. Anything can and does happen. Which is not to say that things happen randomly; there’s a definite logic and actions have consequences. Often, they are dark consequences. This is, after all, a fairy tale. While there is a naivety and sweetness to the story, it is by no means light. It is an epic tale where kingdoms are threatened, armies battle and wizards duel. But while the stakes grow progressively higher, it always manages to maintain an intimate feeling. This is largely due to Agnieszka. I found her very easy to relate to. She’s not the most beautiful girl around. She’s not even the most intelligent–her smarts don’t come from books but from a connection to the present, to people and place. She cares about people and she loves her home wholeheartedly. In fact, she reminded me a lot of Elizabeth Bennett, and Uprooted owes just as much to Pride and Prejudice as it does to Beauty and the Beast. This struck me as a very conscious influence and fans of P&P are sure to catch a few references along the way. As with P&P, there’s romance, but sisterhood also plays an important part. Kasia is not Agnieszka’s sister by blood, but is definitely a sister by choice, and their relationship is a crucial motivator. There was so much I loved about this book and I had terrible trouble putting it down. I’m a little bit sad I have to return it to the library and will be acquiring my own copy. It is definitely a contender for my favourite book of 2015. Thank you to Renay of Ladybusiness for recommending it. I utterly adored it, so thank you! I will definitely have to go and read the rest of Novik’s work now. Temeraire has been sitting on Mt TBR for far too long. neat cover, Elizabeth =) And I must say Earl Grey tea can really hit the spot on tired evening! I am running the Book Blog awards this year for the 2nd year in a row and wanted to let you know nominations are open until October 31st . There are 15 awards up for grabs this year. You may nominate your own blog or ask your readers to nominate you. Readers vote on November 15th. Leave a Reply to Renay Click here to cancel reply. Elizabeth is a freelance editor and author with a weakness for books, tea and silly dogs. © 2019 Earl Grey Editing. All Rights Reserved.